A favorable cost of living and plenty of ways to stay active in retirement have propelled the Orlando, Florida, area to the top tier of listings for best places to retire year after year. 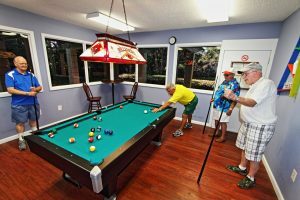 Hyde Park, a gated community for adults 55 and older that’s located just outside Orlando, makes an active retirement even more affordable by providing attractive manufactured homes in a resort-style setting that fosters neighborly camaraderie. To learn more about the affordable active retirement you can enjoy at beautiful Hyde Park near Orlando, FL, contact us today. We’ll be happy to schedule a tour for you when you’re in the area.